Roomin Hostel v Salamanca, Španělsko: Zarezervujte nyní! Este alojamiento tiene 48 horas (2 día) de política de cancelación. Si se cancela dentro de este plazo, el alojamiento le cargará el 90% de la primera noche de su estancia. Un 10 % del precio total de la estancia como deposito que se devolvera al finalizar dicha estancia. Experienced travellers ourselves, we believe that travelling should be enjoyable and affordable. Here at La Dorada we offer quality at a price that will leave even the tightest budgets with extra spending money. Our aim is to provide a comfortable, relaxed and friendly atmosphere in which guests can get to know both Salamanca and each other. As said the famous writer Miguel de Cervantes 'Salamanca enchants the will because once you have experienced its placid character, you have to go back” and we want to convey you the same feeling, because in hostel Salamanca Dorada the time slows down just enough to feel what it would be like to actually live in Salamanca and not just stay in it. 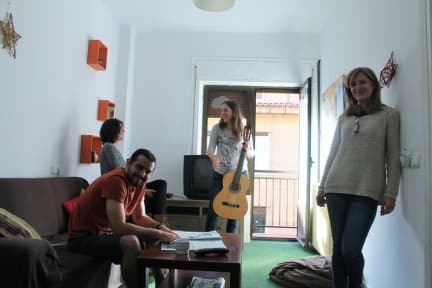 A stay with us is the ideal starting point for a magical journey through the streets of the city, for discovering his unique story, his life on the streets and his known nightlife as well as its culture and its people. - WIFI (in every room). - Your own set of keys. - Separate dinning room with balcony. - Common room with cable TV, book exchange and board games. - As much Tea and Coffee as you can drink.